Procuring items for traditional or silent auctions may seem like a daunting task, but it doesn’t have to be. In this video, we discuss helpful tips, simple methods, and examples of how to get items for silent auctions. 1. Acquire items across a broad price range. Let’s face it, not every bidder in your auction can afford the $1,000 necklace. Make sure that when you are acquiring donations, that you accumulate items with a wide price range. After all, a big part of any successful silent auction is engaging participants. If these attendees don’t see any items within their interests or price range, they won't be interested in bidding. So don’t toss those $25 and $50 donations just yet! 2. Make this a team (committee) effort! Brainstorm and organize possible sources of donations with your planning committee and draft (not recruit) them as solicitors. Each of your committees should explore their personal networks to identify potential donations. If you have a particular business in mind for a donation, identify the best individual you know to request the donation. This is usually the easiest path to acquiring necessary donations. After all, business owners get hit up constantly for donations. So, while your cause may be meaningful to you, it may not be to them. You can circumvent that problem by having someone the business owner knows (even a loyal customer) ask on your behalf. 3. Get visual with your planning process! Most teams rely on a spreadsheet to track donations. However, in the video, Margaret Turner and her team discuss how they do it visually. The Aces for Autism team uses a sticky note approach to organize their donations and solicitations. They place all possible donations (and sources of those donations) on a board and discuss what they should pursue and who should make the ask. 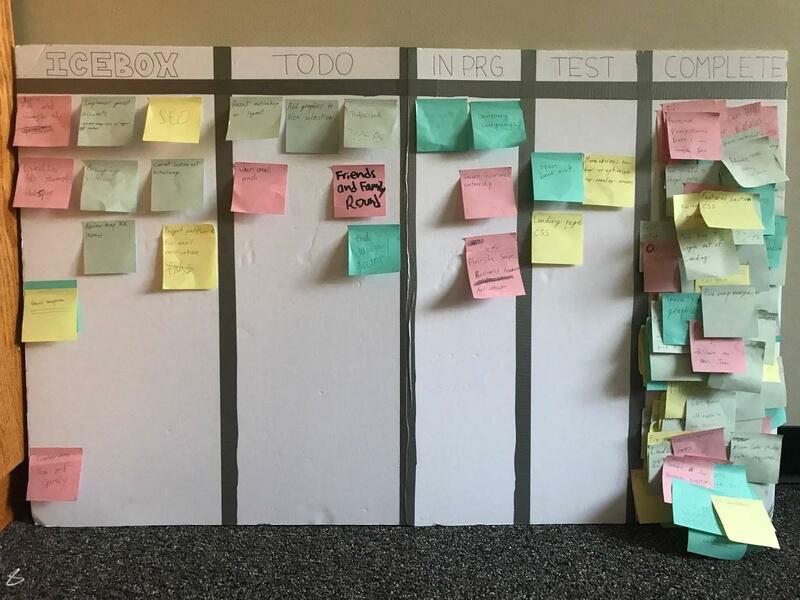 Similar to a scrum board approach for software development, each member of their team has a different color sticky note in order to identify their tasks. This is just one approach; use whatever method works best for your team. This is just an example post it note scrum board. If you are of the digital type, then you can do this electronically with a free tool like Trello. Otherwise, you can certainly head to your office supply store and purchase as many color stickies as you need. Simply create whatever stages on the board (e.g. To Do, Contacted, Confirmed, Refused, Done) and watch things progress. With one glance, you will easily see who is behind schedule! 4. Connect the donation to an outcome. When you request a donation, convey your event’s purpose. While the donor may not empathize with your cause at the level you do, they will be more likely to donate if they feel their donation is making some sort of impact. So briefly explain or show them what you do. If this auction supports a cause that helps disabled children, show them a picture or take your child with you (if you can). 5. Be overly grateful for anything you get. These potential donors are not obligated to give you anything. Also, even if you think the donation is small, it may be a meaningful donation to them. Don’t forget the lesson of the widow giving 2 mites. Even small donations are good donations; these can be grouped with other small donations to form package items. 6. Thank your donors and invite them to your event if you can. This goes without saying but do not forget to thank those who donated to your cause. Aside from the obvious reasons, this is important because a large portion of auction items tend to come from repeat donors. This “thank you” can be a letter, a phone call, a face-to-face interaction, or any combination of the three. Just be sure to make it personal and authentic. Finally, consider Inviting those making donations to your event. This not only strengthens the relationship, but can also lead these individuals to make contributions in the future. Not sure what types of donations to go after? Review our “Great Silent Auction Item Ideas” form available with a click of the button below.